Heaven found in the eco-friendly Tuckamore Lodge in Main Brook along the Viking trail in Newfoundland, the hub for trails to adventure, natural wonders, culture, and history. Arriving at Tuckamore Lodge is like coming home! Secluded retreat accommodation in Main Brook on the Great Northern Peninsula of Newfoundland, Tuckamore Lodge is the perfect getaway for those with a passion for nature, history, culture, and adventure. 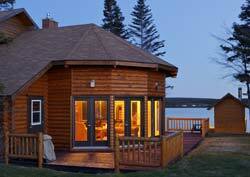 Situated on the shores of Tuckamore Pond, the lodge is framed by a forest of black spruce and fir trees. It's a place where moose, caribou, and black bears graze and roam freely, while squirrels effortlessly dart from one tree to another, and birds serenade you with their songs. Tuckamore Lodge offers the discerning traveler the ultimate in luxury Scandinavian style accommodation. From the minute we arrived, we were captivated with the place. In typical Newfoundland dialect, we received a warm welcome by the friendly staff of the lodge who immediately made it their business to ensure our comfort. Eight guest rooms are connected to the cedar Lodge and there was no trouble settling in to the warm, comfortable and generously furnished suite, walls tastefully decorated with paintings and photography of wildlife and nature. Each suite is designed for double occupancy and feature full en-suite bathrooms, walk-in wardrobes, and large inviting beds. The cedar Lodge features a spacious lounge with a cozy fire - a place to relax and listen to 'fresh daily' stories of adventure told by other guests, or legends told by local Newfoundlanders eager to share their intriguing culture and history. A separate dining room is another gathering place, where delectable meals of traditional Newfoundland fare are served up along with views over Tuckamore Pond. Being close to nature, Tuckamore Lodge has adopted an environmentally friendly policy of recycling, composting, water conservation, and the use of a range of biodegradable detergents all to reduce the ecological footprint of the lodge. At Tuckamore Lodge, the staff take pride in introducing visitors to the area and sharing the secrets of the land. The guides will enthusiastically jump at the opportunity to take you to a favourite fishing spot, on a kayaking excursion, or canoe trip. Snowmobile tours are a popular winter addition to the already extensive list of activities. Tuckamore Lodge is also the perfect place for women travellers to getaway to. An adventure itinerary has been designed specifically with woman in mind who wish to learn wilderness survival, plant identification, orienteering and more. 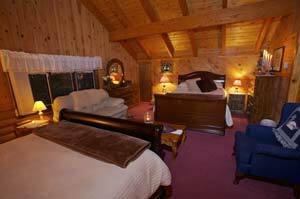 Alternatively simply relax in the peaceful surroundings of the lodge to rejuvenate the spirit and soul. The coastal community of Main Brook where Tuckamore Lodge is located, is a hub, so it doesn't matter which way you turn at the end of the driveway - you will be on a road to adventure. The Viking Trail, the French Shore, or the Grenfell Trail all offer insights into the diverse human history and cultures, geological treasures, and stunning scenery of the Newfoundland wilderness. 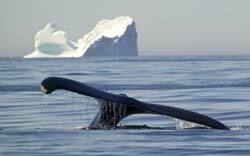 The northern tip of the Northern Peninsula is the best place in the world to see icebergs as they drift by on the cool Labrador currents of the Atlantic Ocean, which is also the summer home to a large population of humpback whales. Having a rich Viking history, a visit to this area should include a tour of L'Anse aux Meadows (a UNESCO World Heritage Site) and The Norstead Port of Trade, during your stay at the lodge. The staff of Tuckamore Lodge are only to happy to arrange bookings for day tours and provide information about a host of other local activities. At the end of a busy day of exploration, relax in the sauna and hot tub facilities or sit on the extensive deck and overlook the lake while indulging in an enjoyable recollection of the day's events. Tuckamore Lodge is a peaceful paradise in the heart of the Newfoundland wilderness.